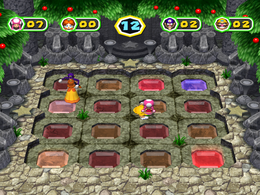 Smashdance is a 4-player minigame in Mario Party 6. The name is a wordplay on the movie Flashdance. The only changes between day and night are aesthetic. At night, the statues are glowing, and there are purple flames on the torches. The day does not have these features. The camera flies through some brush to show the players on a temple-like stage. The players are then surprised as the outer panels glow, followed by the inner panels, then the outer again. 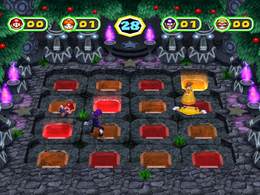 The players must score the most points by ground-pounding the glowing panels. Each tile gives the player one point; when a panel fades to blue, it is a warning that it will fade out entirely soon after. When somebody ground-pounds on a player, they stun the player for almost five seconds. This minigame appears as the first minigame in Decathalon Park. Here, the player's objective is to smash as many glowing panels as possible within the time limit to earn as much points as possible, up to a maximum of 1,000. The default record for this minigame in Decathalon Park is 10 points. The players line up in the center, with the player(s) who won in front of the others. They then perform their winning or losing animations while the statues shake and the panels glow in a pattern once more. Rules – "Ground-pound glowing panels to score. Whoever ground-pounds the most glowing panels wins!" Advice – "Panels glow for just a short time and turn blue as they're about to fade." This page was last edited on March 27, 2019, at 00:06.